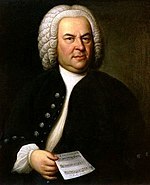 Johann Sebastian Bach (b. Eisenach, 21 March 1685; d. Leipzig, 28 July 1750) was a German composer and organist. He lived in the last part of the Baroque period. He never traveled very far, spending all his life in central Germany, but he studied all the music he could find by other composers of his time. His own music shows that he learned from the music of Italian, French and German composers. He spent several years working at courts of noblemen. Here he wrote most of his chamber music and orchestral music. Most of his life, however, he worked in a church where he was expected to write church music. Bach wrote almost every kind of music except opera. During the last part of his life most composers were writing in a new style called the Classical style, but Bach always wrote in the Baroque style. That made some people at the time think he was old-fashioned, but today we know that his work is the very best of Baroque music. Bach came from a highly musical family. Many of his relatives were professional musicians of some sort: violinists and town musicians, organists, Cantors (Directors of Music in a church), court musicians and Kapellmeisters (Directors of Music at a royal court). Most of them played several instruments. Of his twenty children, several became quite famous composers, especially Carl Philipp Emanuel Bach (1714-1788), Johann Christian Bach (1735-1782), Johann Christoph Friedrich Bach and Wilhelm Friedemann Bach (1710-1784). When he was fifteen, he went to the small town of Lüneburg. At first he sang treble in the choir, but his voice very soon got lower, so he made himself useful playing instruments. He learned by listening to famous organists like Reincken (1623-1722) and Dietrich Buxtehude (1637-1707). Bach got his first job in 1703 in Arnstadt. It was a well-paid job for a young boy who was 18 years old. There was a new organ in the church, and Bach already knew a lot about organ building as well as being a brilliant organist. They asked him to examine the new organ, and then they offered him a job. Bach spent four years as organist there. He composed some organ works. Unfortunately, the congregation were not musical enough to like it. They did not understand the ornamental notes he added to the hymn tunes. Bach got rather fed up with the priests who were always complaining about it, so he resigned and took another job in Mühlhausen, not far away. After a year there, he gave up that job and went to a big town called Weimar. Johann Sebastian was made organist to the Duke of Saxeweimar. At the Duke’s court there was a chapel with an organ. Bach composed many of his great organ works at this time. He became very famous as an organist as was invited to play in other big churches and to give advice on organ building. He was extremely good at improvisation. On one occasion he was in Dresden at the same time as a French organist named Louis Marchant. There was going to be a competition between the two men to see who was better at improvisation. Bach was practicing the day before and Marchant heard him. He realized that Bach would win, so he ran away. Life was not always easy, and there were sometimes arguments with the people who ruled the church. The sub-deacon wanted to choose some of the hymns, but this was the Cantor’s job. Bach was a sensible man, and he managed to get his way without making enemies. On another occasion he argued with the headmaster of the school (Bach had to do some teaching at the church school) about who was allowed to choose the choir section leaders. This actually went to court, and Bach won the case. Bach often made journeys to other towns. In 1747 he visited the court of Prussian King Frederick the Great near Berlin. The king, a music lover, gave Bach a theme to improvise from on the harpsichord. Bach sat down and improvised a fugue using this theme. Later Bach wrote a very long composition for flute, violin and harpsichord with cello accompaniment, in many movements, all based on this theme. At the end, the theme is heard in 5 of the 6 voices. Bach called it The Musical Offering and he sent it to king. Bach wrote many fugues, eventually he decided to write a collection called The Art of Fugue. His plan was to publish it, but he died before he could finish it (his son later published it in his honor, as Bach's last published piece). In the last year or two of his life, he became blind in spite of two eye operations. This page was last changed on 20 May 2018, at 00:40.